Sri City, October 26, 2016:- Ms. Krongkanit Rakcharoen, Consul General, Royal Thai Consulate General, Chennai, accompanied Ms. Jittima Nakamano, Consul -Commercial and Mr. Lawrence Edward, Trade Officer visited Sri City on Wednesday. On their arrival at Business Centre, Mr. Ramesh Subramaniam, President, Sri City Foundation extended a warm welcome, and briefed them on the infrastructure and the unique features of Sri City. 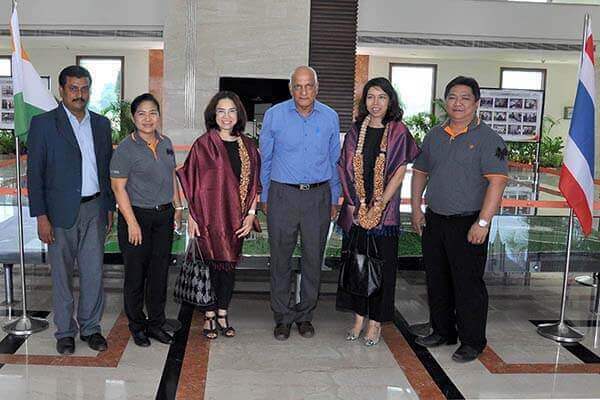 The Consul General and her entourage went round the industrial park and had a close glimpse of the production facilities at Rockworth, a Thai company at SEZ that makes and exports office furniture systems.